1. According to a newly conducted research, organic cow’s milk was found to be healthier than conventional milk. 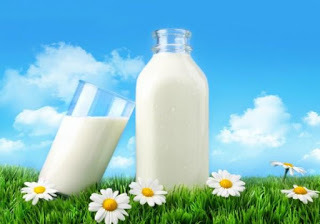 Organic milk is the milk from a cow that has been raised and reared using natural (meaning organic) methods, allowed to graze freely, fed on fodder that has been cultivated organically and not subjected to synthetic drugs that increase its milk supply. Conventional milk, by contrast, is the milk from a cow that has been specially reared to supply huge quantities of milk, perhaps injected with growth hormones to speed up the process. 2. According to Charles Benbrook, who is a research professor at the Center for Sustaining Agriculture and Natural Resources at Washington State University, organic milk is richer in fatty-acids(that are good for your heart) than conventional milk. Tests done on nearly 400 milk samples of the abovementioned categories, carried on over a period of one-and-half years, in The Washington State University have brought to light these results. Feeding the cow more grass has a direct relationship to the percentage of fatty acids and protein its milk contains. 3. In the United States, grassfed cattle are raised basically for beef production. Dairy cattle are fed on corn, grains and soy to increase their milk production. But, milk from a cow that has been kept on a grain-based diet tends to be higher on omega-6 fatty acids, which are prone to increasing health risks. Organic milk is healthier because of its lower ratio of omega 6 to omega 3 fatty acids, as compared to the regular milk from a cow fed on the conventional diet. 4. The health effects of omega-6 fatty acids are largely dependent on their conversion to omega-6 eicosanoids. Both omega-6 and omega-3 can give rise to ecosanoids, but, omega-6 ecosanoids generally cause more inflammation than omega-3 ecosanoids. Eicosanoids exert a complicated control over the workings in our body, on our immunity and the central nervous system. They cling to the receptors found in our tissues. 5. Our stomach converts omega-6 to arachidonic acid, which is basically a polysaturated form of the omega-6 fatty acid, which causes swelling. Omega-3 counter-balances the effects of omega-6. Now, if our diet consists of too many omega 6 fatty acids, and not enough omega 3 fatty acids, to counteract its effects, we run the risk of developing cancer, and various heart diseases, and inflammation. That is why it is so important to keep the ratio between the two low. A ratio of omega-6: omega-3: 2.3: 1 is ideal for maintaining a healthy heart. 6. It is vital to note that both omega 6 and omega 3 fatty acids are essential and important, and so is the balance between the two. If the balance is affected, various health problems begin to pop up. If organic milk proves to be too costly for one, conventional milk is still relatively safe to consume, provided it is whole milk, and not skimmed milk, or milk containing 2% fat. The healthy fatty acids in the milk are a part of the milk’s fat content. If you choose 2% fat milk, the health benefits of milk will be reduced by half. 7. Low fat or skimmed milk will reduce the benefit by 66%. Even if you do not consume milk and other dairy products, it is a healthy option to limit intake of products that are high in soy and corn oil, which have unhealthily high ratio of omega-6 to omega-3, 49:1. Corn oil is less expensive than other oils, making it an ideal choice for frying junk food like chips or French fries. So, whether one chooses to consume organic milk, or conventional milk, or chooses to steer clear of dairy products, it is important to know the ratio of omega-6 to omega-3 fatty acids, if one is to maintain a healthy lifestyle.